View of the lake from the top of the PWC boat ramp after our morning swim. Every time I drive by Jordanelle Reservoir on Highway 40, I see a long line of buoys and think about going for a swim. This morning I finally did something about it. I met Sue, Stacey and Scott at the PWC boat ramp this morning at 6:00am. It was a nice morning, and not as cool as I expected. The water was glassy and there were no fishermen, boats, or anyone else in sight. We had the whole lake to ourselves. The State Parks website has been showing a water temp of 65 degrees for the past few days and I was expecting it to be at least that, if not higher. To all of our surprise, the water temperature was actually closer to 62 degrees. Once we got moving, it didn't feel to bad. We swam out to the red buoy and then turned left (east) and followed the buoys (I think there are 8 white buoys). As the sun started coming up, and my goggles started fogging up, it was hard to see the last few buoys. At the last buoy I stopped for a second to see how Sue and Stacey were doing. Scott had gone back to shore. We swam back to the red buoy where we started and only then did I start feeling a little cold. We went past the red and green buoys to the end of the buoy line (5 more white buoys). At the end of the line we stopped for a minute and Sue said she was getting cold and was going to go back to the ramp. Stacey and I were both ok with that, and we took off again. I wasn't really shaking after we got out and I felt like I could have kept going. Since this was my first "cold" water swim in a while, I didn't want to push it. Next time I'll try to go a little further, maybe an hour or so. 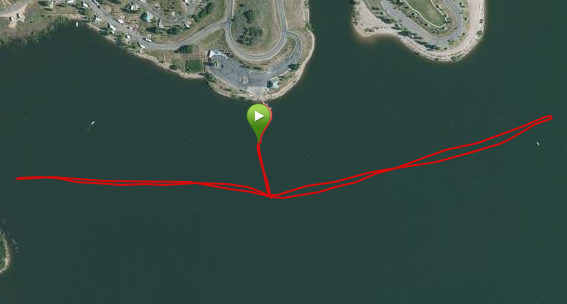 Swimming along the buoys near the PWC boat ramp at Jordanelle Reservoir. We ended up at 1.37 miles. It's not a bad little route. The buoys are more-or-less in a straight line and are all pretty close to the shore. The facilities are also pretty good: flushing toilets and outdoor showers. I'm planning on making this a regular Wednesday morning swim if anyone wants to join me.